(Warwick, 1991; Holt, 1992). Since that time, however, herbicide resistance has been reported for 145 weed species in 45 countries throughout the world (Heap, 1999). Herbicide resistance is appearing in additional weed species at a rate equal to that observed for insecticide and acaricide resistance in arthropod pests (Holt & LeBaron, 1990), and weed biotypes now exist with resistance to one or more herbicides in at least 16 different chemical classes, including the arsenical, aryloxyphenoxyproprionate, benzonitrile, bipyridilium, chloroacetamide, cyclohexanedione, dinitroaniline, dithiocarbamate, imida-zolinone, phenoxy, substituted urea, sulfonylurea, triazine, and uracil compounds (Heap, 1999). Under field conditions in which the same herbicide or chemical class of herbicides is applied repeatedly, herbicide resistance may evolve in four to five years (Holt, 1992). 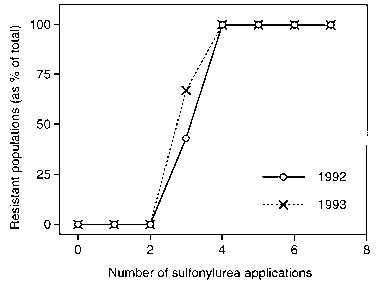 As shown in Figure 1.3, resistance to sulfonylurea herbicides was detected in all populations of the grass weed Lolium rigidum collected from Western Australia wheat fields that had been treated with those compounds only four times (Gill, 1995). Evolved resistance to glyphosate, which was thought unlikely to occur, was reported in 1998 for a L. rigidum population collected from an Australian orchard that had been treated with glyphosate two or three times a year for 15 years (Powles et al., 1998). 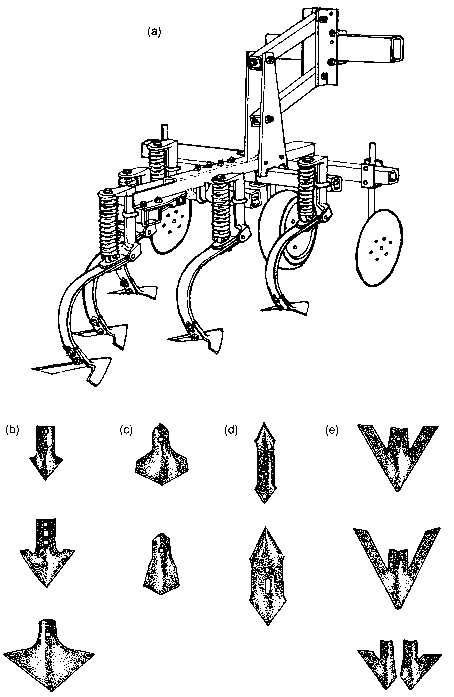 Suggested strategies for preventing or delaying the evolution of herbicide resistance in weeds include using individual herbicides with different modes of action sequentially and using mixtures of herbicides with different modes of action concurrently (Gressel & Segel, 1990; Wrubel & Gressel, 1994). The underlying assumption in these strategies is that weeds are less likely to evolve resistance to several unrelated compounds than to a single compound. The evolution of weed biotypes with resistance to multiple classes of herbicides is a real possibility, however. This phenomenon is common in insects (Georghiou, 1986) and has been observed in Lolium rigidum in Australia (Burnet et al., 1994; Gill, 1995) and Alopecurus myosuroides in the UK (Holt, 1992). Of particular interest is the ability of weeds to evolve resistance to distinct classes of herbicides as a consequence of exposure to, and selection by, chemically unrelated herbicides. Burnet et al. (1994) reported, for example, that a L. rigidum population in Victoria had become resistant to nine different chemical classes of herbicides after 21 years of exposure to five herbicides in only five classes. Lolium rigidum is a major cropland weed in southern Australia and, as a species, has demonstrated resistance to most of the major herbicide chemistries used there (Powles et al., 1997). Increasing costs of research, development, and registration are reducing the rate at which new herbicides are introduced into the marketplace. The cost to a company of developing and registering a pesticide product increased from $1.2 million in 1956 to an estimated $70 million in 1991 (Holt & LeBaron, 1990; Leng, 1991). Concomitantly, the chances of a newly discovered chemical becoming a legally registered product have decreased greatly; Holt & LeBaron (1990) cited the odds as 1 in 1000 in 1956, compared with 1 in 18 000 in 1984. Increased costs of toxicological testing and legal work associated with the regulatory process are also leading many agrichemical firms to not seek re-registration for the use of herbicides in crops that occupy only small areas, e.g., vegetables and fruits (Anonymous, 1989). Partly as a consequence of rising costs for discovering, developing, and registering new herbicides, agrichemical firms have merged with seed and biotechnology companies to produce new crop varieties with resistance to existing herbicides, especially glyphosate, glufosinate, bromoxynil, and sul-fonylurea, cyclohexanedione, and imidazolinone compounds (Duke, 1999). Many of these varieties have been produced using recombinant DNA technologies. Worldwide in 1999, herbicide-resistant, transgenic varieties of soybean, maize, cotton, rapeseed, and other crops were planted on 28 million ha (Ferber, 1999). The broadscale deployment of these and other genetically engineered crops has been met with controversy in Europe, Japan, the USA, and elsewhere because of environmental and consumer concerns. Thus, the extent to which herbicide-resistant crops will be used in the future is uncertain. If herbicide-resistant crops are accepted and used widely in coming years, herbicide resistance in weeds will remain a concern, since herbicides used with these crops will exert the same types of selection pressures that they do in herbicide-tolerant, non-genetically engineered crops. Shifts in weed community composition toward species pre-adapted to tolerate herbicides applied to herbicide-resistant crops are also possible (Owen, 1997). In addition, transfer of herbicide resistance from crops to related weed species through pollen movement may create new herbicide-resistant weed populations (Snow & Morán-Palma, 1997; Seefeldt et al., 1998), which would have to be controlled by different herbicides or other means. The combination of herbicide resistance in an increasing number of weed species, slower introduction of new herbicides, and withdrawal of older herbicides means that farmers are likely to have fewer chemical control options within the next several decades. For this reason, alternative weed management strategies that make full use of nonchemical tactics need to be developed. This is an easy-to-follow, step-by-step guide to growing organic, healthy vegetable, herbs and house plants without soil. Clearly illustrated with black and white line drawings, the book covers every aspect of home hydroponic gardening.